The Gili Islands in Indonesia are known for their pristine waters, incredible coral, and diverse marine life. Most visitors make sure to put in as much snorkeling time as possible to check out the colorful reefs and armada of sea turtles that populate the islands. If you’re looking for something a bit more unique, be sure to make your way to the Gili Meno statues. 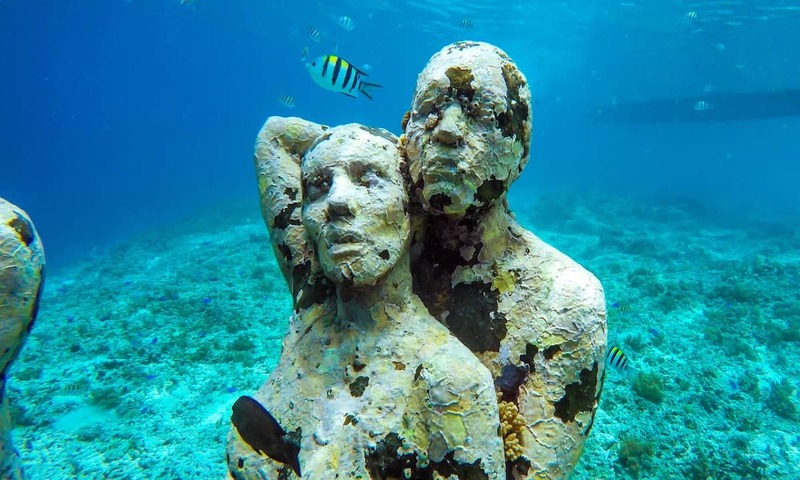 These underwater sculptures are what mermaid dreams are made of and make for the most epic travel photos! 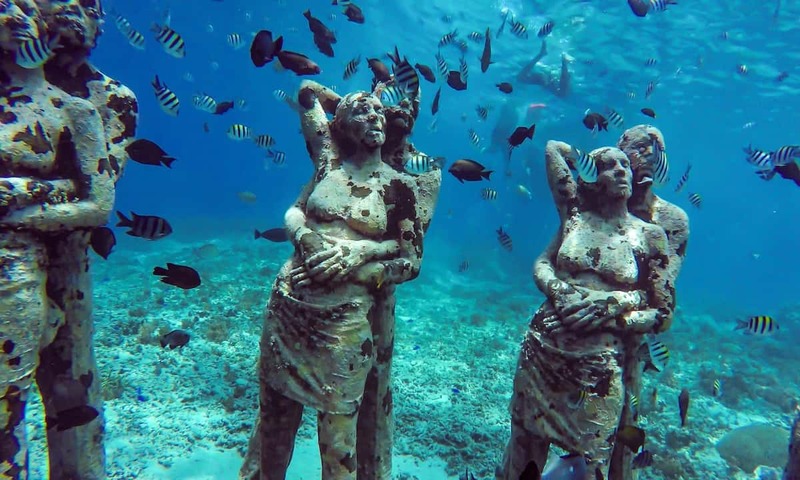 Described as “hauntingly beautiful”, the Gili Meno statues have quickly become a snorkeling and diving hotspot. 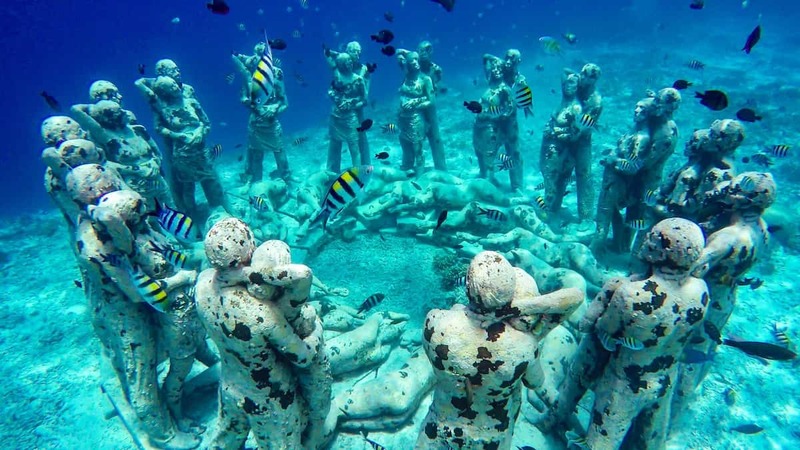 The project, named “Nest”, was commissioned by BASK, the eco-resort in which the statues sit in front of, and created by British sculptor, Jason deCaires Taylor. Symbolizing life and continuity, 48 life-size statues are situated in a circle. Embracing figures surround more people curled up on the ocean floor. Each statue was made from the casts of real people, making the sculptures even more unique. 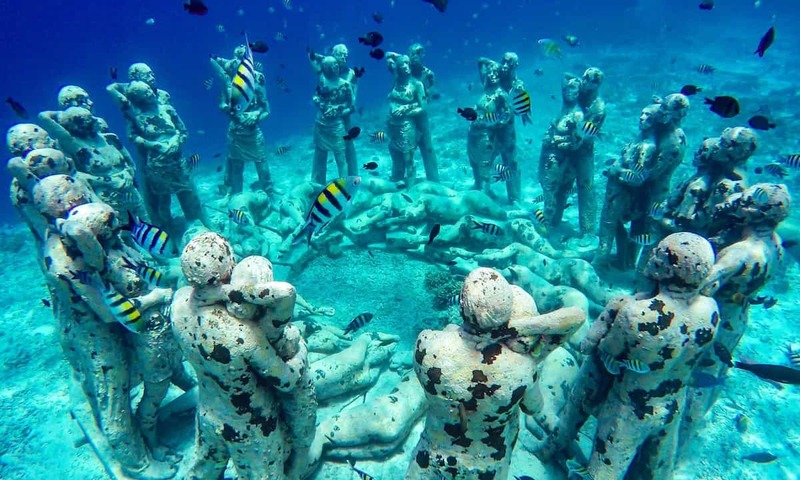 Jason deCaires Taylor is a renowned underwater sculptor, with pieces in the Canary Islands, Mexico, West Indies, and even a temporary exhibit in the Thames in London. Not only is Nest an incredible photo opportunity, but it’s designed to be the home for coral to form a beautiful man-made reef. Nest is an environmental space and was created to be a home for coral. The world’s coral reefs have been dying at a rapid rate, including Indonesia’s incredibly diverse reefs. The recent earthquake in August of 2018 and the illegal anchoring along the shores of the Gili islands have contributed to the destruction of coral reefs. However, the main causes for the bleaching and death of coral reefs worldwide are inflicted by humans: pollution, overfishing and climate change. 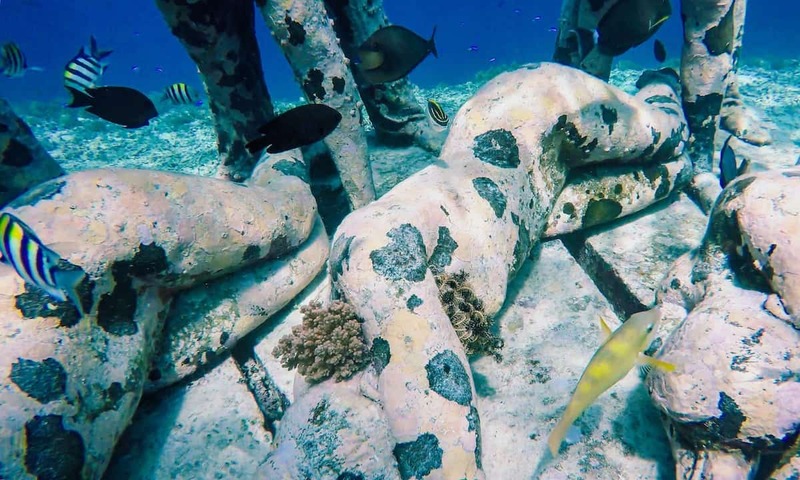 These statues will eventually be the home of a fully-established reef. Made from pH neutral, environmental-grade cement and anchored to the seabed, Nest offers a platform for marine life to inhabit. Soft corals and sponges will first create a home on these statues, which will then provide the foundation for more marine life to flourish here. You can already find plenty of fish and even sea turtles at Nest. Not only do installations like these help save reefs across the world, but they bring an abundance of tourists, which spreads awareness about the need for reefs to be saved in the first place. The Gili islands are three small islands off the coast of Lombok in Indonesia. 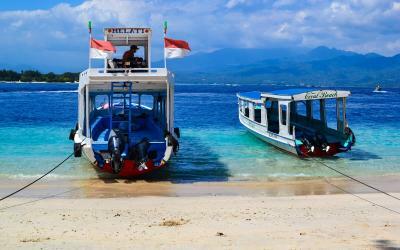 Just an hour or two boat ride from Bali, these islands are a common stop for travelers. Gili Meno is the middle island between Gili Trawangan to the west and Gili Air to the east. Gili Trawangan is the most popular island for backpackers but Gili Meno is only a 15 minute boat ride away, making it easy to hop over, even for a day trip. The Gili Meno Statues are located on the west side of the island in front of the Bask Resort. Bask is still under construction and set to open in 2020. If you’re staying on Gili Trawangan, you can take a boat to Nest. 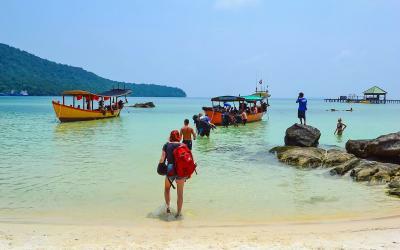 Various tour companies operate on the island, with prices between IDR 150,000 and IDR 350,000 for a snorkel trip that will also take you to other spots (where you’re bound to see plenty of sea turtles). You can also kayak or stand up paddle board to Gili Meno, but you’ll of course have to take turns diving under while someone mans the equipment above water. For those on a budget, just hop on the daily local boats, which leave from Gili Trawangan to Gili Meno (and Air) at 9:30 a.m. and 4 p.m. Tickets from Trawangan to Meno cost 35,000 and 40,000 to Air. Local boats from Meno to Trawangan leave daily at 8:50 a.m. and 3:20 p.m. If you’re looking to just go on a day trip, you’ll want to leave Gili Trawangan at 9:30 a.m. and come back on the 3:20 p.m. boat, giving you about 5.5 hours to explore. From the Gili Meno port, it’s about a 15–20 minute walk to Bask Resort. There are places to rent bicycles near the port if you prefer to cycle around the island. Head to Bask resort and then you can just swim out to Nest. It’s about 100 meters out from the beach over mostly shallow water. 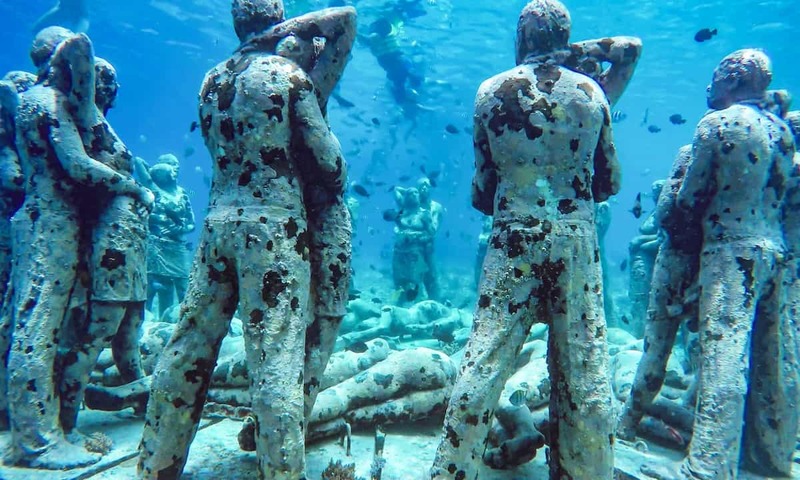 The statues themselves are only about 4 meters deep, making it accessible to both divers and snorkelers. As you’ve probably guessed, these statues have gotten incredibly popular. Go during peak times (around 10 a.m. to 12 p.m.) and you’ll see hoards of boats and tourists surrounding the statues. 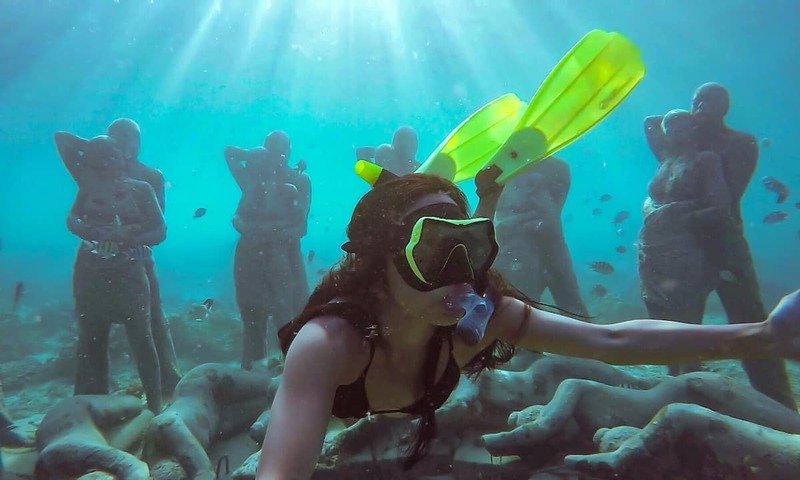 This less-than-magical experience means loads of people in the back of your photos, including far too many life-jacket-clad swimmers floating right above the statues. For the best photo ops, come early in the morning (8 a.m. or earlier) or try around 1 p.m. when many of the boat tours are having lunch or returning. If you’re swimming from Gili Meno, be careful of the sharp coral. Wearing fins will help you swim down to the statues to get a closer look at the growing coral. Please respect the wildlife and do not touch or provoke any animals you see. Feeding the fish might offer some great photos, but this disrupts the ecosystem so people are strongly advised against it. Be sure to also wear “reef-safe” sunblock (plenty of shops on Gili Trawangan sell it including Kayu Cafe, Gili Eco Trust, and Pituq Waroeng), as normal sunblock has chemicals that harm coral and other marine life. 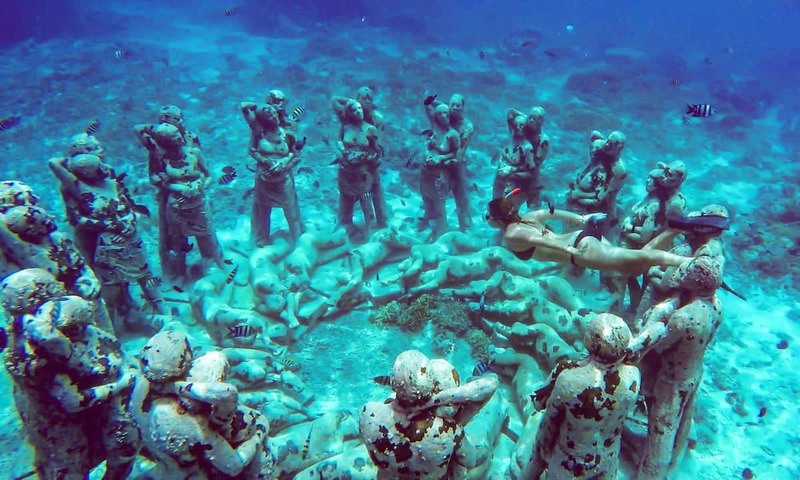 Did you enjoy this article about the Gili Meno underwater statues? 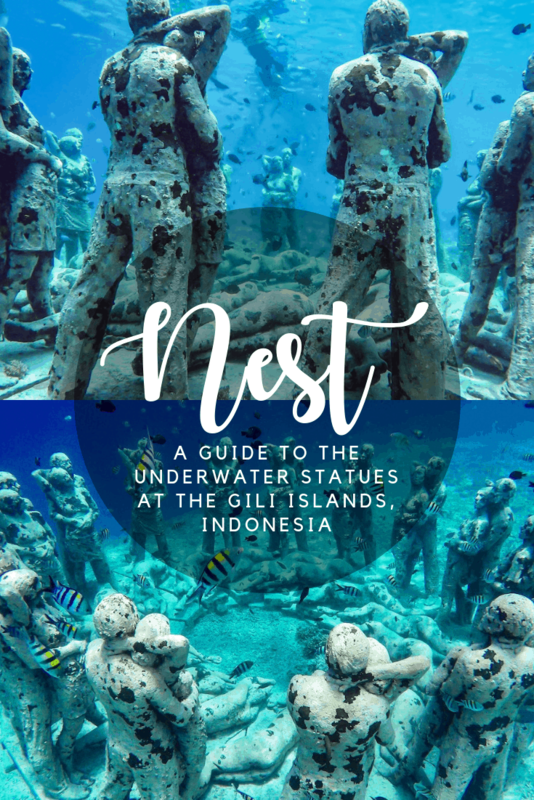 Interested in finding more unique snorkeling spots and underwater statues? Then check out these other articles to discover more epic underwater worlds!